Back in August I posted about my first experience with Mrs. Dalloway by Virginia Woolf, and it sparked off a burst of creative thought among my new-found blogging friends, Claire, Emily, and Frances, among others. We agreed that a read-a-long of several other books by Woolf was called for, and picked January as the month to do business. The idea has been in the back of my mind since then, and has shaped my vague reading plans for the new year. Claire, who planted the initial idea in our heads, got on the ball this week and what began as a reminder has blossomed into a full fledged group-read, spanning two months, four books, and three glamorous hosts + myself (the somewhat terrified newbie). Frances and Emily have already posted beautiful invitations and explanations at their respective blogs, and the response has been huge – and hugely exciting. We’re encouraging participants to join us for one, two, or all of the books, or just chime in on the discussions if you’ve already read the books. Frances and Emily are self-termed Woolf ‘geeks’ and ‘dorks’, so the experience lies with them, while I’ve only read one book by the author and Claire is about to venture into the world of Woolf for the first time. There’s plenty of room here for any kind of reader. Please join us! Can’t wait to read with ya’ll! Sandy – You’ve GOTTA read this! « Pandas, Bowling Balls, Whale Sharks, and Largest Bas Relief Sculpture in the World! Sarah, I’m in for all four. Yay! Thanks to all of you for putting this together! I have to admit I’m a little intimidated but then my excitement for her overpowers much everything else. I’m just too glad to have you 3 leading along!! I am SO IN for Mrs. Dalloway! My copy is second-hand and used to belong to a college student. So it came with all these convenient margin notes and highlighting. 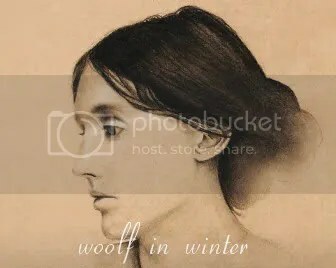 I’ve never read Woolf, but as I mentioned on Frances’ blog I’m in! Looking forward to it! Steph – It took a slight adjustment for me to figure out how to read Woolf, but once I did I liked it. I can completely understand how it could be not quite someone’s thing though. I do hope you jump in at some point! EL Fay – Nice! So glad you’re going to hang out with Woolf and us this winter. So excited! Doing a little dance! 🙂 Thanks for volunteering to kick things off with Mrs. Dalloway. I can’t wait. I cannot wait to start Mrs. Dalloway in January. Thanks for adding me to the list. I’d like to join in and re-read all four. I love Orlando; not so keen on The Waves. But it will be fun to read them again in company. Violet – Great! Glad to have you with us. I’d love to join in (it will be Woolf in Summer for me! )- will definitely try for all four. Don’t forget me, I want to join! XO, B. Great list of readers! I’m really looking forward to reading Woolf and I’m happy Mrs. Dalloway is first and not just because I already have this book! Hi, great challenge. I havent read any books of Virginia and I really want to join. Hiya! I’m in for all 4 Woolf books. Cheers! I will join you too. Nadia and Kaye – Thanks for joining! Sarah, Count me in for Mrs Dalloway. I’ve read several of Woolf’s essays but never the novels. This is also my first group-read, so I am interested to see how it all works. Your comments on reading this novel for the first time make me gung-ho to get started. I might have to put my Johnson biography aside (again) for a little while. I’m all set to go now with three of the books in hand and the fourth on order. Please include my name in the participants list. I’m starting Mrs. Dalloway after midnight tonight as part of the New Year Read-a-thon. I’m really looking forward to the discussions. Thank you. Anthony – I hope the group read proves to be fun and rewarding for you! Thanks for joining. oh oh me me! I wanna join up for Mrs. Dalloway too! I’ve always intended on reading it! This sounds like fun! Great idea – please count me in for all 4. As far as I’m concerned The Waves, Mrs Dalloway and To The Lighthouse are literal descriptions of experience and I consider The Waves to be the very pinnacle of English literary achievement. Inconveniently I think I am also in love with the bloody woman as well! I’m reading “A Writer’s Diary” at the moment – 1 volume containing all those entries from her diaries which deal with the development of her work and what she thought about others’. There are some great insights into her thinking on all four books. I just finished Mrs. Dalloway, and I’m going to put down my thoughts on finishing the book now, while it’s still fresh in my mind. Am looking forward to the discussions though – it was my first Woolf, and all said and done, I did enjoy the experience. I want to join as well! Going through Mrs Dalloway at speedlight, to catch up and not miss the discussion on Jan 15. I read it before, like 10 yeras ago, but I want to read it again. Especially since I am also reading a biography of Virginia Woolf! What a great companion to the challenge! biffo2 – Hi there! Sorry I couldn’t get back to you sooner – I’ve been traveling. Start reading whenever you’d like – I will be gathering links to posts as people write up their thoughts and post them around the 15th. The four of us who are hosting are still experimenting with the format, so I may kind of lead a discussion on my page…but we’ll see what happens! Mihaela – Glad to have you. I have some light speed reading to do myself! I’ll link to your page (and yours, biffo2) on my more recent post about the group read. Percival – Duly noted. I’ll change it in the updated list, which is located at my post ‘Paging Mrs. Dalloway”. I’m participating too, for all 4 books. I’m only about 70 pages into Mrs. Dalloway, though. Hi Melissa, glad to have you. I’ll add your name to my more recent list (https://tuulenhaiven.wordpress.com/2009/12/31/paging-mrs-dalloway/) and will eagerly await your post about the book whenever you finish it!